We trust Ms. Mitchell's scholarship (and her voice) because the whole of her work is concerned with articulating the heart of Chrysostom's exegesis, ''his author-centered devotion to the person of Paul.'' Chrysostom's interpretations glow with the love of his subject, incorporating Paul as a living member within his textual conversation. Mirroring Chrysostom's own ''clear Attic prose'' (a reference to the mode of Greek and honeyed rhetoric he employed), Mitchell considers her own subject with a similar elucidation. Devoting the first two chapters to an examination of sources as well as the contexts of fourth century study and rhetoric, she presents the following three chapters as a gallery for Chrysostom's Pauline portraits -- systematically interpreting his artistic description of the apostle's feet, hands, back, mouth, heart, eyes and soul -- and comparing Paul's redemption to the perfect standard of Christ. Mitchell's final chapters are used as a comparative study to strengthen her case for an ''author-centered'' exegesis, followed by two appendices including a fresh translation of St. John's homilies on Paul as well as several color plates (depicting both Paul and Chrysostom) and an extensive bibliography. Yet our best accolade for Mitchell's work is the way she unites person with study, a shining example of vocation as transformation. 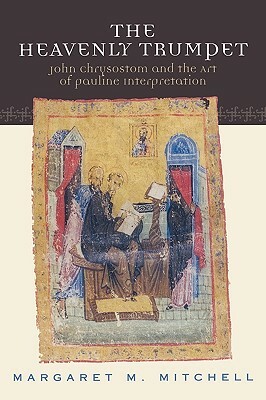 Arguing that all Pauline interpretation depends significantly on the ways in which readers formulate their own images of the apostle, Margaret M. Mitchell posits that John Chrysostom, the most prolific interpreter of the Pauline epistles in the early church, exemplifies this phenomenon. Mitchell brings together Chrysostom's copious portraits of Paul--of his body, his soul, and his life circumstances--and for the first time analyzes them as complex rhetorical compositions built on well-known conventions of Greco-Roman rhetoric. Two appendices offer a fresh translation of Chrysostom's seven homilies "de laudibus sancti Pauli" and a catalogue of color plates of artistic representations that graphically represent the author/exegete dynamic this study explores.